Gastric Band Surgery - How Much Does It Cost? Gastric band surgery is a common type of weight loss procedure for people with a BMI over 30. An adjustable band is placed around the top part of the stomach to reduce its size. This makes you feel full more quickly, reducing the amount that you eat. You can expect to lose up to 50% of your excess body fat with a gastric band, but long-term lifestyle changes are necessary if you want to enjoy the full health benefits of the surgery. Gastric band surgery costs around £6,500 in the UK. If you are worried about the affordability of the procedure, most private weight loss surgery clinics provide financial assistance to help you pay for the surgery. A gastric band is a type of surgery that’s designed to help overweight people lose weight. It works by restricting or limiting the amount of food that can enter the stomach and makes you feel full more quickly. An adjustable band is placed around the top of your stomach to create a small pouch. The larger part of the stomach below the band remains unused. The pouch can only hold a small amount of food before the feeling of fullness is triggered. A gastric band therefore tricks the brain into believing that you have consumed enough food. For people who struggle to lose weight through dieting and exercise, it’s a way of controlling portion size and achieving long-term weight loss results. In the first year after a gastric band procedure the average patient loses around 40% of their initial excess body weight. The following year weight loss will usually slow, but patients can still expect to lose another 10%-20% of their excess body weight. 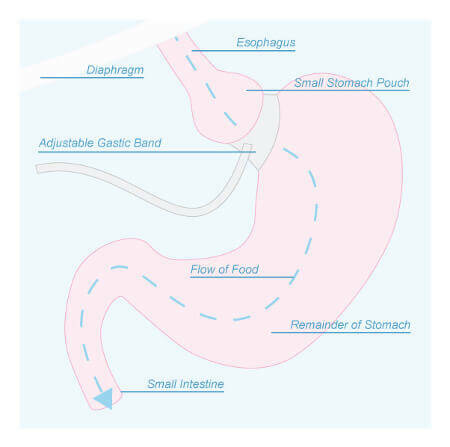 A gastric band is designed to remain around your stomach for a long time. You can have the band removed, but you will need to undergo another surgery. Some patients that have their band removed do put weight back on as your stomach returns to its normal size. Any type of weight loss surgery is viewed as a last resort. As a result, it will usually only be advised when you’ve repeatedly tried but failed to lose weight through making healthy lifestyle changes, such as eating better and increasing the amount of exercise you undertake. You won’t be able to have gastric band surgery if you have certain health problems such as heart disease, or have already had surgery on your stomach. The operation also won’t be available to those with a psychological disorder. To find out if you are eligible for gastric band surgery at a private clinic, you should book a consultation with a surgeon. By filling out the form at the top of this page, we can put you in contact with surgeons at some of the UK’s leading weight loss surgery clinics. If you’re considering using a private clinic for gastric band surgery, prices do vary. However, in the UK you should expect to be quoted a price that ranges from approximately £5,000 up to £9,000. Clinics will give gastric band prices on an individual basis, so your quoted price may be considerably higher than what is advertised on the clinic’s website (as this is only a guide price). If you’re looking for the best deal when it comes to gastric band surgery, we’ve sourced the starting prices for the leading weight loss clinics in the UK in the table below. Gastric band surgery can be a huge expense but that doesn’t mean you can’t benefit from the procedure. Private clinics understand that many people cannot pay out the total cost in a single payment, so they offer a variety of finance options to help you spread cost of the treatment. Some clinics offer their own finance packages, while others will recommend that you use a third-party provider such as Zebra Finance. Most finance solutions will require you to make a deposit before the operation is conducted. This may be a set price or a percentage of the total cost of the gastric band surgery. Following the surgery, you’ll then be responsible for making pre-arranged monthly instalments until the remainder of the balance is paid off. The length of finance solutions can vary but it will be fixed for a defined period of time during the agreement process. Monthly instalments will often require you to pay interest (APR) on top of the price of the procedure. This can increase the longer your payback period. Dedicated gastric band surgery finance can be the most cost-effective option, as some providers will charge you 0% interest. Speaking to your chosen clinic about finance options is a good place to start if you need financial support. If you want to review the clinics with the best finance options available, we’ve gathered the essential information you need in the table below. You will undergo an assessment by a multidisciplinary team (MDT) comprised of a group of health professionals including a surgeon, psychologist and dietician. They will carry out a range of physical, psychological and nutritional tests to determine your suitability for the procedure. If you are deemed a suitable candidate for gastric band surgery, you will be put on a low fat, low carb eating plan for two weeks leading up to your surgery. This diet will help to reduce the size of your liver, making it easier to fit the gastric band correctly. It can also help you to lose some weight, which can lower your chance of developing some serious complications during the operation. If you smoke, you will be asked to abstain for several weeks before the surgery, since smoking can increase the risk of blood clots and infection, as well as prolong your recovery from the operation. Six hours before gastric band surgery, you will be instructed to refrain from eating and drinking. This is to ensure the stomach is empty when the band is fitted. You will placed into compression stockings and given an injection of heparin to thin your blood and prevent clotting. Gastric band surgery is performed under general anaesthetic, so you’ll be asleep throughout the entire operation. The surgery takes approximately one hour to perform. The surgeon will create three or four small keyhole cuts in your abdomen. A thin tube with a camera on the end (known as a laparoscope) will be placed through these cuts to allow the surgeon to see inside your tummy. The band will then be inserted through the keyhole cuts and placed around the upper half of your stomach to create a small pouch below. The band will be connected to an access port via a thin tube, which will be placed just below your skin. The access port allows saline fluid to be inserted and removed from the band to adjust the size of the opening to your stomach. The band is then secured in place so it can’t come undone, and the small keyhole incisions will be closed using stitches. Immediately after surgery you will be placed in a recovery room. Once you are awake, you will be able to drink water as and when you need it. You will also be given painkillers to ease any pain or discomfort you will feel. Once you are able to, you will be encouraged to get up and start moving around as this can increase blood flow and reduce the risk of blood clots. You may feel well enough to return home on the same day, but most patients are discharged within 24 hours of undergoing the procedure. This is at the discretion of the surgeon however, so you may have to stay in hospital for several days if it is deemed necessary. You will not be able to drive following gastric band surgery, so you should arrange for a family member or friend to collect you. You will be given a set of post-operative care instructions by your surgeon which you must adhere to in order to ensure an optimum recovery. As with any surgery, you do need time to recover following a gastric band procedure. Recovery times vary from person to person, but most people are able to resume their daily routines within two weeks of the surgery. While you are recovering, it is important to get plenty of rest. Although you will feel tired, you should try to move around as much as possible. It is recommended that you should gradually increase the time you spend walking to up to 30 minutes per day. This should be at a speed that makes you sweaty and slightly short of breath. You will be advised to only consume liquids immediately following surgery. Your dietitian will discuss with you when you can begin to introduce more solid foods, starting with puréed food. Your meals will be much smaller than before the surgery as the gastric band constricts the size of your stomach. You may also need to take vitamin and mineral supplements in the early stages of your recovery. Some patients notice weight loss within just a few weeks of having a gastric band fitted, but adopting a healthier lifestyle will improve the speed at which you lose weight. Over the first year after surgery, you can expect to lose up to 50% of your excess body weight. Your band may need to be adjusted several times during this period to aid your weight loss. Blood clots: following surgery, you will be given medication to reduce the risk of blood clots, but it’s still a complication you should be aware of. The most common place for clots to form are in the lower leg or lungs, with chest pain, shortness of breath, feeling faint, and pain being common symptoms. Wound infection: the incisions made during your gastric band surgery may become infected as they heal. Symptoms of an infection include pain, swollen skin, and pus coming from the wound. Infections can be serious, but with a course of antibiotics they typically clear up fast. Gastric band slipping: there is a small chance that your gastric band will slip out of place, causing heartburn, nausea, and vomiting. If this happens, you will need additional surgery to securely put it back in place. Gallstones: it’s quite common for patients to develop gallstones in the first or second year after weight loss surgery. They can form if you lose weight quickly and can be dangerous. The most common symptom of gallstones is sudden, severe pain in the abdomen. Excess skin: you may find that you are left with excess rolls or sagging skin following weight loss surgery, particularly in areas such as your tummy and limbs. This is due to the skin stretching over many years and losing its elasticity. Cosmetic surgery such as a tummy tuck or arm lift can remove this extra skin and improve the shape and tone of your physique. Are There Any Alternatives To A Gastric Band? Having a gastric band fitted should be your final option. The best method to lose weight is by making healthier lifestyle choices, such as eating less and exercising more. Attending weight loss support groups in your local area is a good way to help you commit to making these changes to your lifestyle. Your GP may also prescribe you medications to help you lose weight. If these techniques do not work or you are dangerously overweight, weight loss surgery will be advised. There are other surgical options to having a gastric band fitted, however. A gastric balloon is a less invasive procedure in which a balloon device is inserted into your stomach for six months to limit your food intake. Alternatively, gastric bypass surgery or gastric sleeve surgery involve permanently changing the size of your stomach to restrict the amount of food you can eat. Your surgeon will help you to decide which type of surgery is best for you during your consultation.